RUPANDEHI, Jan 23: Overcrowded prisons is not a new issue for our country. Stories of dozens of prisoners sleeping in a cramped prison cell draw headlines time and again and the issue have now become a reality but not a shocking one. But what about the marshals in the parliament that are responsible to provide security to lawmakers and other dignitaries? It has to come to fore that the marshals of Province 5 parliament are being deprived of even basic needs at the province’s parliament. “Our changing room, sleeping room, and the bedroom is the same. There is a small corner where we all marshals sleep on in a narrow space at night,” said a marshal requesting anonymity. There is a small hall on the third floor of the office of the secretariat of the province’s provincial assembly which has been partitioned into three rooms. One is assigned to female marshals and two have been assigned to the males. “Though it is called a hall, it is not a hall actually. It is not bigger than an average family room. But still using aluminum partitions, the room is divided into three segments for us,” the marshal said. There are a total of 43 marshals in the province. Though the government is yet to consider their needs and comfort, a lot is demanded from them. “We are expected to appear very tidy, neat and clean. After all, we guard lawmakers,” he quipped. “But we don’t have the facilities that we require to keep up to their expectation. It’s big trouble for us,” he lamented. A glance at the rooms of those marshals speaks louder. There are piles of uniforms and other clothes. Blankets and beddings are in disarray. Shoes are seen struggling to find a place to rest. The marshals have been going to work this way since a year now. 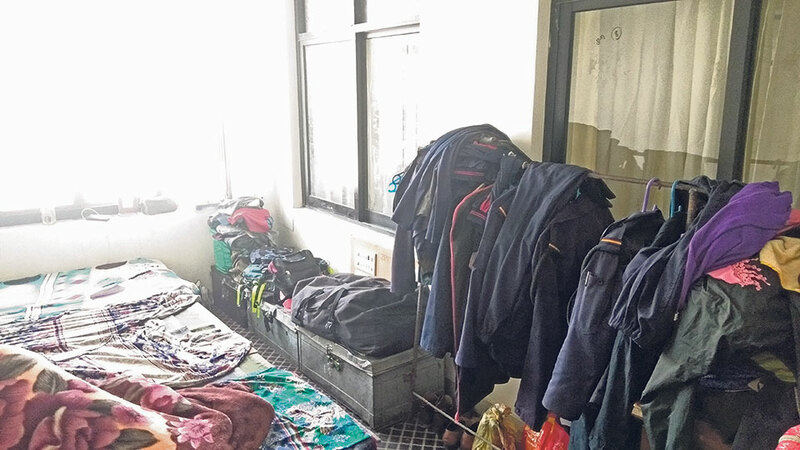 Chief of the marshals, police inspector Hom Prakash Chaudhari, said that even though they are ‘maryadapalak’ (one who takes care of modesty), the way they have been living at the office has not allowed themselves to be what they are supposed to be. “We are called maryadapalaks, but this term does not match our lifestyle. It has been a year since it has been so and I am not sure if the conditions will ever improve,” Chaudhari said. He shared that thought the police personals who are serving as marshals get their salary, their living quarters and facilities given to them are very poor. The mess for the marshals is run on the terrace of the building. A small corner is used for their kitchen where their meal is cooked. But they don’t have enough place to sit and eat properly, the marshals claimed. 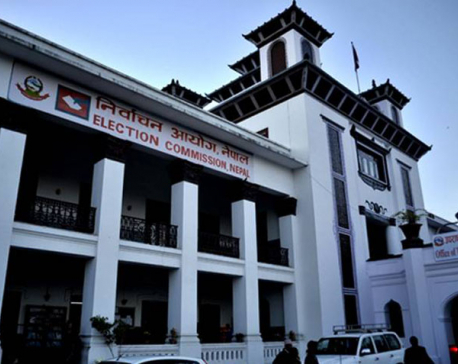 According to Chaudhari, he has tried to draw the attention of the office of the secretariat to it. “But seems that we were not able to convey our concerns properly to the authorities concerned. They have partitioned a small room into three parts and named it changing room. But that very changing room is also supposed to be the marshals’ bedroom. The space is not enough for 10 persons to sit, how are dozens of marshals supposed to sleep and live in there?” he asked. Women marshals have even serious problems. They have to wear a sari, blouse, and a black coat but they lack proper space for changing their clothes, let alone doing laundry and ironing them. Interestingly, the province recently purchased expensive vehicles. As per the record, over Rs 80 million was spent on purchasing 13 vehicles. According to marshals, they had talked to the speaker of the house Purna Bahdur Gharti regarding the matter. He had then consulted about it with the assembly’s secretary Durlav Kumar Pun. However, the issue remains unaddressed so far. “This is the problem of the secretariat, how did this matter reach you?” Pun was quoted asking to Gharti, when the latter shared the marshal’s concerns with him. As per the need of the assembly, the police headquarters had deployed some well-experienced marshals for the province.